Meditation is NOT the technique. Let me paint a different picture which will illustrate what I mean. Imagine that you are standing at the ocean shore and you want to experience the water. Now, there are many techniques to get into the ocean. Some people may fearlessly run or dive into the water. Others may walk in steadily, unerringly. If you’re like me, you go in up to your ankles and then run out as soon as any threatening wave comes your way! The ocean slowly draws me into it. Clearly, there are different ‘techniques’ to get into the water, but the technique itself is not the thing that you seek. What you seek is to experience the ocean itself, that is, the experience of being wet. In exactly the same fashion, there are many different techniques to lead you into meditation, but the technique itself is not the goal. The goal is to experience the inner ocean—to be washed over by our own inner ocean of consciousness. The technique is only important to the extent that it gets you into the water. You may recall I suggested that technique syndrome comes from ‘adult’ processing. Here’s why. Consider the infant learning how to walk. I had the wonderful opportunity to experience this first hand with my niece, Madison. I spent a lot of time with her during her first year and watched her learn to walk. At the appropriate time, her parents placed her on her two feet and encouraged her step-by-step to walk, until she got both the gist of the task and the strength to accomplish it. In this case, the parents knew the child’s capacity long before the child did and encouraged her to walk. Apart from this, there was no instruction set. She wasn’t told, “Okay Madison, first recruit your quadriceps muscle on the left and simultaneously the hamstrings muscle on the right. Now reverse.” There was no language – only example and encouragement. Needless to say, Madison did not succeed on her first attempt. How many times did she fall on her way to her first successful step? Yet at no time did she ever say, “Hey Mom, I need a new technique”, or give up the task entirely saying, “Hey Dad, I’m going to stick with crawling, I just can’t get this walking thing down.” No. Instead, she simply brought her constant enthusiasm to the task, despite not knowing exactly what the goal was or how to get there. This is precisely the attitude we should have when we approach our meditation. We are entering into a new, unexplored world – an inner world. Like a child, we don’t know what that really is, or where the goal rests. So bring the enthusiasm of a child to the task, and you’ll take a very giant step towards a fruitful and fulfilling meditation. This post is an excerpt from Pradhan Balter’s article published in the March 2018 issue of Yoga Magazine. 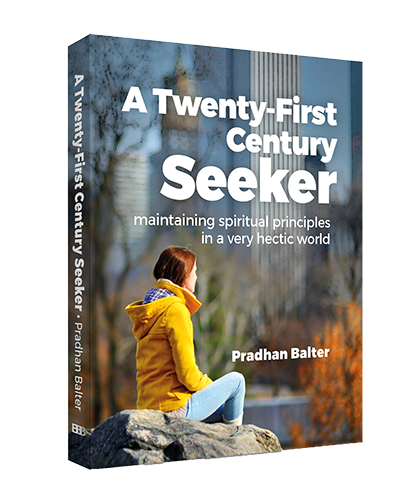 Pradhan Balter is an author of recently published book ‘A Twenty-First Century Seeker – Maintaining spiritual principles in a very hectic world‘.